The Chocolate Milk Cow is our Pet of the Month for September 2018! The Chocolate Milk Cow is one sweet pet! Life on the farm is much more relaxing for this cute cow when they get to nap on their Chocolate Loft Barn Bed! Once they wake up, make sure you feed them their favorite snack: some Cocoa Butter Biscuits! Adopt the Chocolate Milk Cow in September , and you’ll get a loot bag full of surprises and a Pet of the Month prize you can’t get anywhere else! 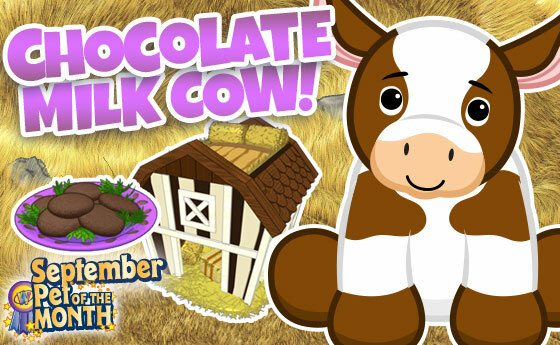 And don’t forget—you can get the virtual version of the Chocolate Milk Cow at the Ganz eStore! Want to enhance the Pet of the Month experience? 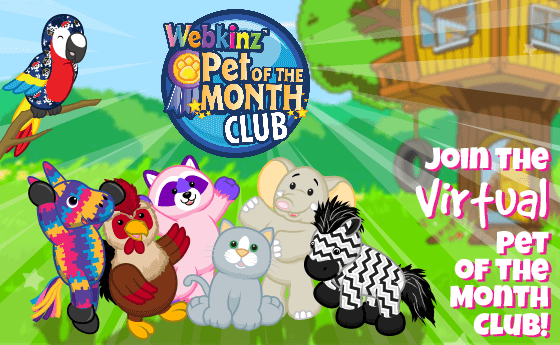 Why not join the Webkinz Virtual Pet of the Month Club? Click here to learn more about the Pet of the Month Club! You may find this and much more at eStore! Where can I purchase the plush version? Do you still get the loot bag if you already have a Chocolate Milk Cow, or do you have to adopt one this month? nginx/1.12.2″ every page I click on here. Don’t know who to report it to. Cache is cleared, etc etc. Was fine yesterday. Had this before and after a few weeks it cleared up … Ganz can you please look on your end? Big thanks!!! This, as well as fake Amazon winning pop-ups. I hope they can fix these issues soon! We’ve been having the same issue here for months now. Ganz, we can’t buy your products if we can’t see them due to 502 Bad Gateway and/or constantly being logged out by your site. You’d think they’d care!!! Piling on the Bad Gateway issues, holy cow, has it been bad the last couple days!!! And I’ve already noticed a pattern (for me, anyway) where it is the worst of all every day in the hour before the daily reset, which for me is 7 PM. It can get up to MORE than every other page ending in Bad Gateway. I’ve had stretches where 10-12 refreshes in a row all result in that before it actually reloads the page (and then the next refresh goes right back to bad gateway. Bad Gateway….hello, not trying to travel to the Fairy Realms, just want the prize. I adopted the Chocolate Cow yesterday. This is the first time I have ever had 2 back-to-back pets of the month. I named her Vache. (Pronounced Vash). It just means “cow.” I couldn’t come up with anything better. She is in my “meadow” room with 2 other cows, Arby and Lucy Butterfield. (“Meadow” is just an empty outdoor room). I’ll have to get some fencing there so that I can include my Longhorn steer, Tumbleweed, with the 3 cows. He’s old and sleeps a lot. I’m pretty sure Vache will let him have her new PSI to sleep on. I’ve seriously considered joining the Virtual Pet of the Month Club, but two things always hold me back: I’m in Canada and find the exchange rate daunting, pricing me right out of consideration (especially for just pixels); and, some of the pets you choose don’t always appeal to me. I already have one so no loot bag for me, but I look forward to doing the extra POTM activities. :) The Plush for this pet is adorable! She’s currently sitting beside my bed. @MommaSays, LOLOL! Idk how you did that face, but it’s hilarious! Dress your cow in a helmet, onesie and boots and call it a Midnight Tiger. No one is the wiser and you save yourself 90,000 points, or about 90-120 dollars depending where you live. Just sayin. Its cute….. But I’m trying to sell my soul to get the moonlight tiger…..
Oh boy…. The Stupid stuff i do….. I am gonna regret buying him….. I don’t think you will! I’m seriously considering it too. Wish I had bought points when they were 35% off!! I totally agree!! I started Webkinz back in 2006 and somehow missed getting the original cheeky dog and cheeky cat. They were the only 2 I didn’t have so about 3 years later I just HAD to have them and I spent waaaaaay too much money (more than $100 each!) for them and they are still packed away not even registered. Once I had them I thought they were too expensive and special to register, so now they are packed up , all wrapped up to keep them pristine and they are in the attic somewhere. I know it’s stupid…. but I will never spend that kind of whacked out crazy amount of money for a pet again. Even if it is for just one day!! Eventually they bring out something “similar” … and even if they don’t when we are all walking around the park or club rooms most people won’t even realize that you are walking around as a $100 pet and I am walking around with a much cheaper pet!! Save your money and buy a one year deluxe membership!! And if you wait until Christmas/New Year time they always have some awesome sales on memberships and points …. sometimes as low as half price!!! You could get a one year membership and 100,000 points for $100 if that happens. Just my opinion. Don’t keep plush in an attic. The extremes in temp are hard on plush, much like putting them in a basement. If you have them wrapped in anything but cloth or acid-free paper, the off-gassing of plastic can prematurely brittle or even cause mustiness of the faux fur. The best way I’ve found to store plushes is in Space Bags. Yes, they get smooshed but they fluff out, back to normal, as soon as you open the bag and fluff them up a bit by hand. Taking the air out seems to keep temps and mold, smells out of them and it is like hermetically sealing them. I have had some same Webbies for 12 years packed in this way, and once in a while take one out, then revacuum the bag tight. Every one is still perfect though a few might need a hair tussle or mane fluff. If they DO get smells, they clean up terrifically by putting them in a bag with uncooked, white rice. I’m not making this up! Leave them in a sealed bag with the rice overnight, give a good shake before opening, and then voila! The rice absorbs the smells and cleans the fur. @Katz1259, The only pet I regret not getting is the basic dog you could chose when you opened a free account before WebkinzX. I have 2 accounts with the cute basic cat. They are so cute! But if I had known the opening a new account process was going to change, I’d have hurried to open one just to have the basic dog! I am truly hoping that it is very much like the Golden Turtle Dove we got at Christmas time. That was such a wonderful surprise! I have estore points set aside for this gem and I do hope it is not just an incentive pet, but also can be purchased outright. XD :’-) Nada! So sad, but they are just there for show. Nobody actually lands on that space. :/ Enjoy Owen, though, and your month of activities! Yep, I believe it. It’s just a tease.